Becoming a collector of anything was never a conscious goal for me – the colors of these socks just jumped out and grabbed hold of me. Adding impressive knitting skills and intriguing techniques to the mix sealed the deal: I’m a collector! 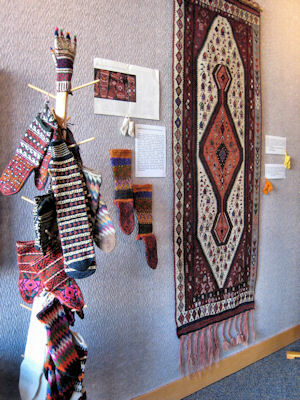 Most of the socks in this exhibition are from Turkey although some are from Bulgaria and the Central Asian countries of Uzbekistan and Turkmenistan. When I travelled throughout Turkey in May of 1994, I was aware of the tradition of vibrantly colorful knitted socks because Piecework Magazine had published an article about such socks along with a pattern and I had even knitted one but not yet two socks. Disappointed at first at finding only “tourist” socks made of acrylic yarns in simple designs and techniques, I was thrilled to spot authentic Turkish socks – sophisticated colors, complex designs, and WOOL – in the window of Ali Aykut’s small store when walking back from the souk to my hotel in Konya only to be crushed that the store was closed. Finding it again the next day, I happily spent a long time choosing, fortified by the always-offered glass of tea, and emerged with eleven pair of socks and the again always-offered “gift” from the shop owner. This time the gift was a charming pair of children’s knitted socks. After leaving Konya, I found the occasional pair of socks here and there, often in a carpet store. When I would show the carpet salesman the photo of the one Turkish-style sock I had knitted and pleadingly said “yun chorap” (wool sock), the answer was always the same whether he was twenty, forty, or sixty: “My grandmother used to make socks like those”. And sometimes a bundle of bits and pieces of textiles would emerge from a large plastic bag buried in a back room. I’d patiently comb through the contents to find a sock or two. My next great fortune was to meet Sinasi Celikkol, the owner of an antique shop called Karagoz in Bursa who was also a local tour guide. His shop proved a treasure-trove with several stacks of beautiful examples of many styles of Turkish socks. I travelled from 1990 through 2010 with Craft World Tours which was a two-person business offering trips to many parts of the world. Tom and Sherry Wilson, by the time of the Turkey trip, had become my good friends and they found my sock-hunt quite amusing. The next time they travelled to Turkey, I sent along a few photos of my favorite styles with a note saying “I’d like more of this kind please” as they had kindly offered to add to my collection. On later CWT trips to several Central Asian countries and to Bulgaria, I was able to expand my collection as those countries as well had an impressive knitting tradition that was expressed in equally stunning socks. My friends Tom and Sherry both passed away in 2011 and their dream, Craft World Tours, is no more. I would like to dedicate this exhibition to their memory with wishes for peace in this small world we all inhabit. Anatolian Knitting Designs, Betsy Harrell. Redhouse Press 1981. Ethnic Socks & Stockings, Priscilla A.Gibson-Roberts. Fancy Feet, Anna Zillboorg. Lark Books, 1994.